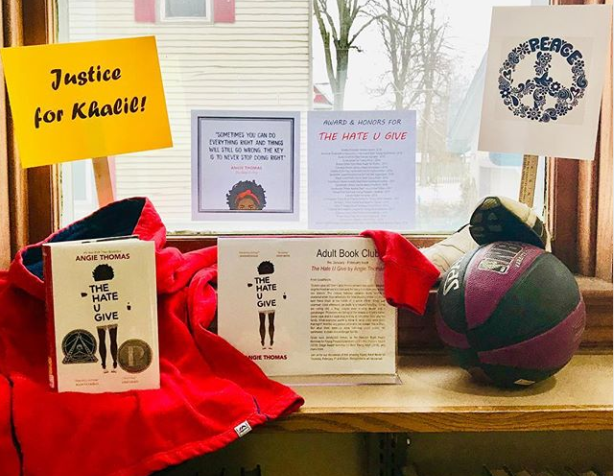 Adult Book Club will be discussing the Angie Thomas novel The Hate U Give on Thursday, February 7th at 9:00am. After all the snow and bitter cold, we are finally thawing out over here at the Vicksburg District Library. After wind chills reached nearly 30 below, today’s 40 and above weather feels like bikini season! We apologize for our closures last week and greatly appreciate everyone’s understanding for the safety of our staff and patrons. If you have any questions in regards to returns and/or fines, please feel free to come in or call us and we will be happy to help. But for now, we are open and getting back to it! The weather made sure no fun at the library happened last week. Tuesday belongs to the Seniors this week as we have three events lined up for them. Bridge Club starts at 9:30am and is followed up by Brown Bag Lunch at 12:30pm. Bring a bagged lunch with you and join us for a relaxing afternoon of games and crafts. On Thursday morning, Adult Book Club will be meeting at 9:00am to discuss the book The Hate U Give by Angie Thomas. Coffee, tea, and muffins will be served. The theme for February’s reading will also be announced. We are getting reading for Valentine’s Day here at the library and our displays are showing it for the next few weeks. First, our tall cart is stocked with the romance novels that people around the globe are talking about on Goodreads. Second, the DVD stand is stocked with all your favorite romantic movies for you and your sweetheart. Third, who was your heartbreaker? Prince? Elvis? The CD stand at the Circulation Desk is stocked with our favorite musical heartbreakers for your listening pleasure! ← We’re back at it!